Make a statement with this polished silver ring featuring a large solitaire cubic zirconia set in four claws with stone set shoulder detail. 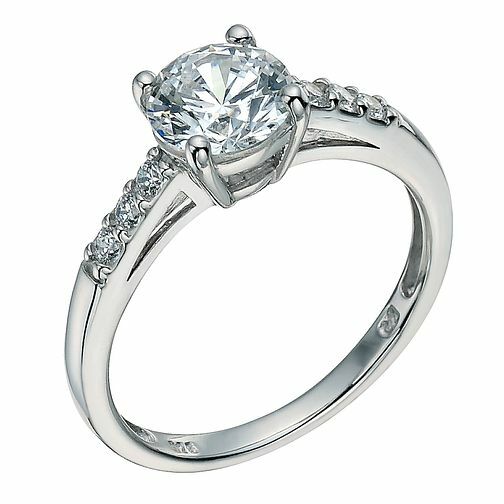 Silver cubic zirconia solitaire ring is rated 4.3 out of 5 by 9. Rated 5 out of 5 by Anonymous from This ring is amazing absolutely love it! This ring is amazing absolutely love it, such value for money looks and feels like the real thing! Rated 5 out of 5 by Anonymous from What a bobby dazzler Very happy with the purchase, delivery and correspondence from Ernest Jones, would highly recommend. The ring was beautiful and very well received, many thanks.